Woke to the caroling of butcherbirds and the harsh call of the blue-winged kookaburras (which are as raucous as laughing kookaburras, but have a different call—just noise, no laughter). 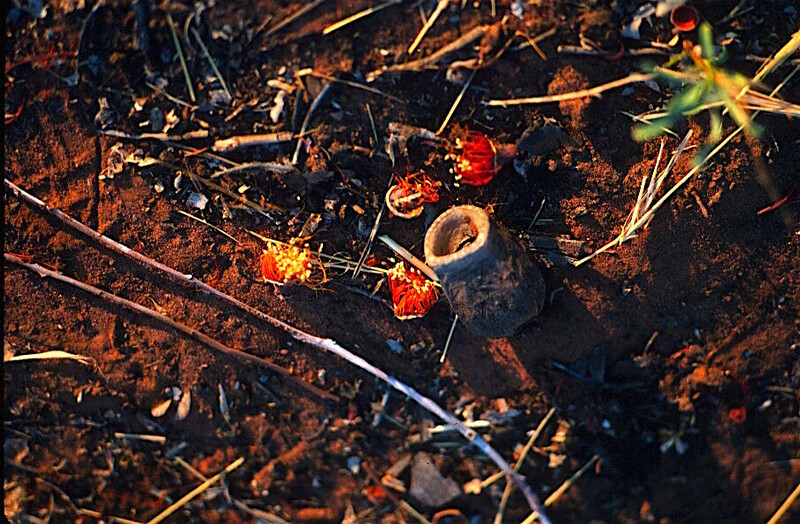 The ground is littered with the orange flowers of the woolybutt gum trees that surround us. The caroling of the butcherbirds increased as the sun rose and was joined by other bird songs. The sun coming up on the red rock walls around us was dramatic and beautiful. The air is fresh, and cooler than it has been. An all together delightful morning. Then on the road again. The stark, magnificent beauty of this strange land draws me in again, deeper with each passing mile. I thank God for this trip–not just returning to Australia, but the opportunity to go farther out. 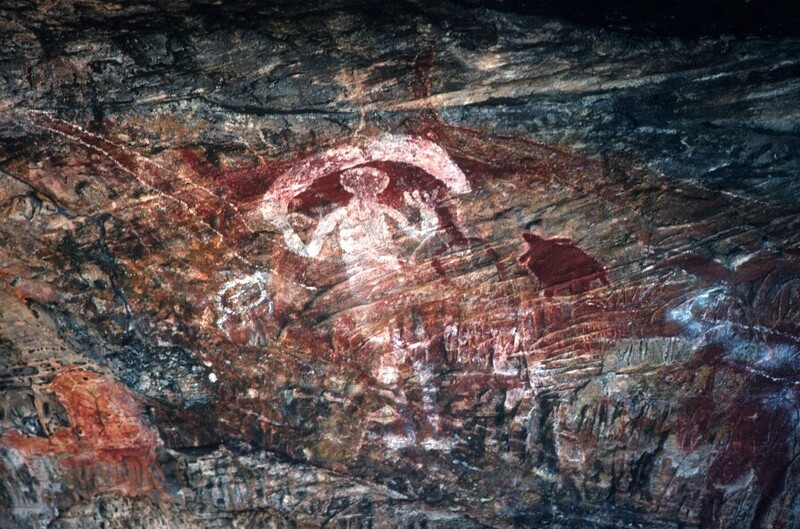 However, the rock paintings were wonderful, as well, strange and otherworldly. Trusting the information panels at the site, I feel fairly confident saying the two large figures with rays or feathers coming out of their heads are Gangi Nganan, said to be the very first of the Mirriwung, an indigenous group in this region. 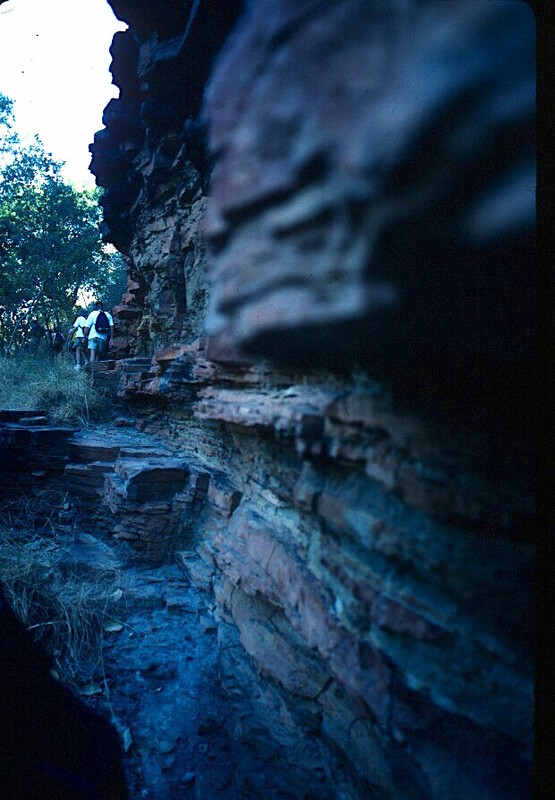 The second photo features many layers of paintings, showing that the site was used for a long time. Here, mythic creatures blend with everyday life and food animals. 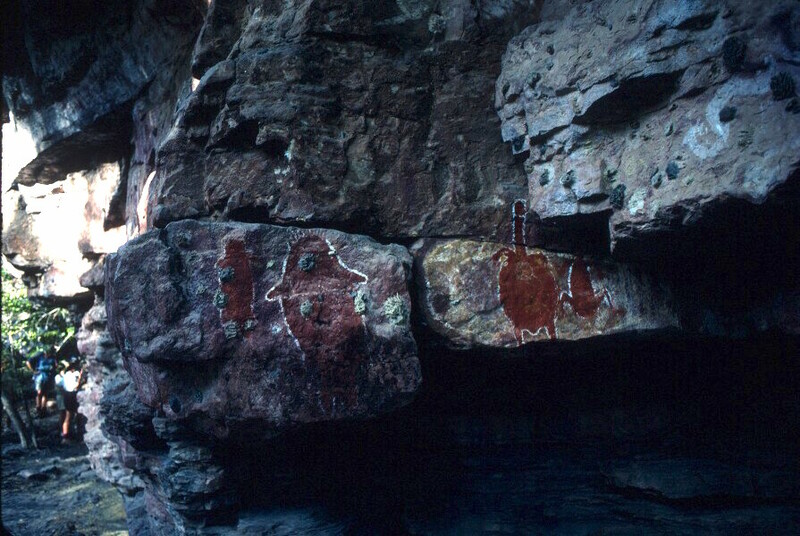 The first images were scraped into the rock, while the white, yellow, and red painted images were later (though still, in most cases, centuries and even millennia ago). Another delight was coming across a cluster of empty mud nests built by fairy martins. Fairy martins are members of the swallow family. 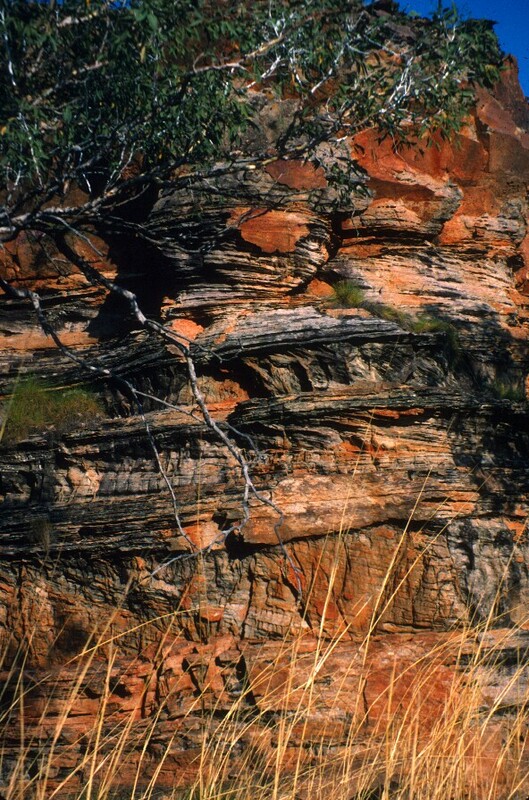 They build their remarkable nests on vertical rock walls, though generally in protected areas, such as a caves. 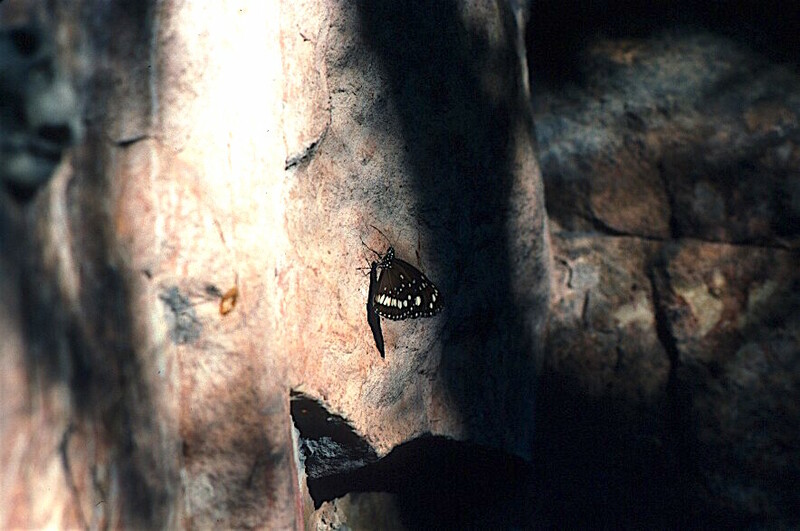 On my first trip to Australia, I had seen fairy martins dashing in and out of a cave in Katherine Gorge, but did not see the nests. This time, I saw the nests but not the martins. The river is wide, the barge is slow, plus one must land at a place where it is possible to easily disembark the barge and find the road. However, the crossing was wonderful, so we didn’t mind that it took a while. On the far side of the river, we continued on, rocking and pounding down the track. After a nasty jouncing, we left station property and joined the Victoria Highway not far west of Timber Creek. The highway is sealed, which is not as romantic as crashing through the wilderness, but it is more relaxing. 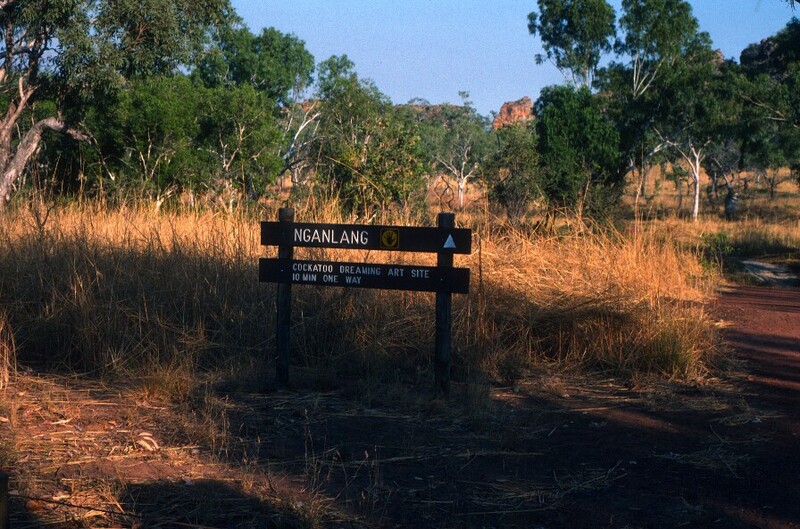 We were heading now for Keep River National Park, which is about 40 kilometers east of the Western Australia border. The pleasure of driving on a sealed road was short lived, but this time, it was because of construction, rather than wilderness. Phenomenal beauty continued to surround us: massive formations of weirdly broken red rock covered with kapok flowers and boabs; huge stretches of shattered, red-rock walls that look like the ruined fortifications of some ancient civilization; tumbles of boulders; golden grass and even more, larger boabs. It is absolutely wonderful. 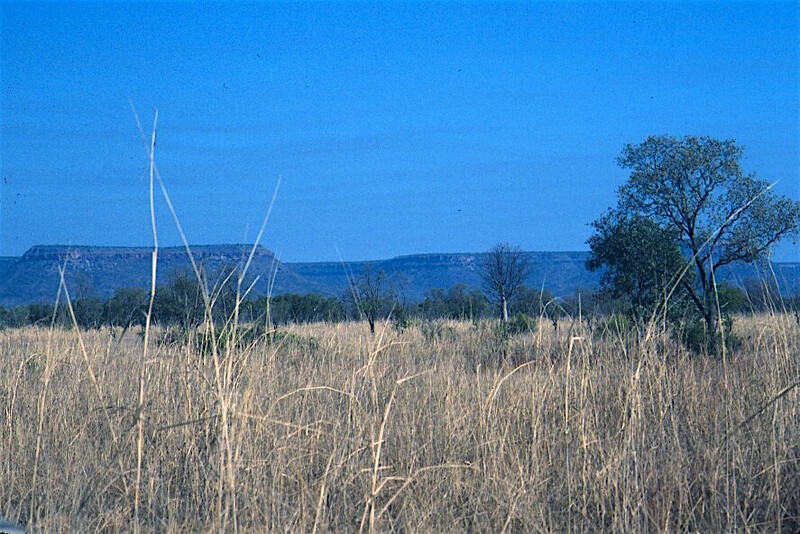 Suddenly, the terrain was again flat, gum tree-dotted savannah. Then hills again, but this time low and rolling, worn rather than shattered. 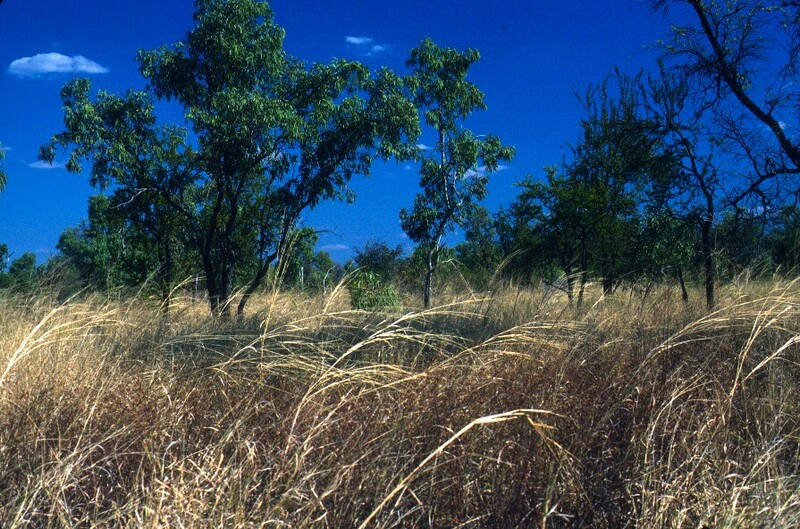 And then flat again, an endless sea of brown and golden grass and eucalypts, with only occasional scatterings of kapok, boab, and melaleuka. Then, in the distance, mountains. 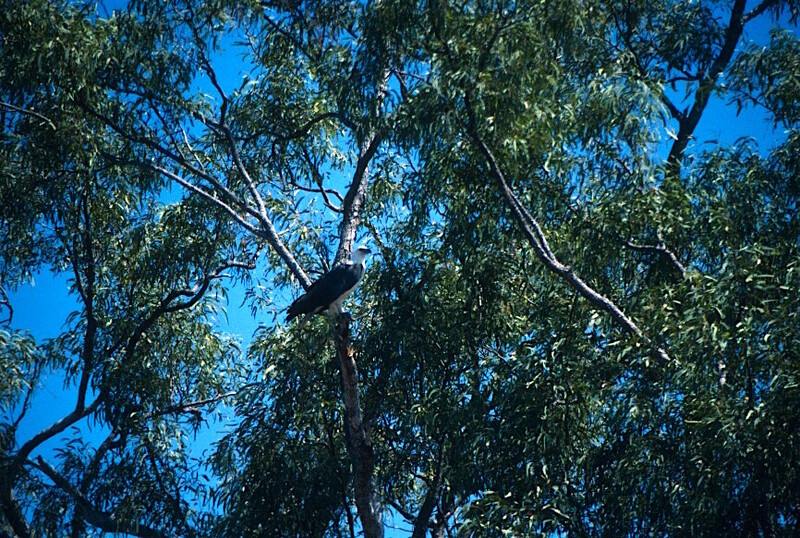 Among the trees, red-tailed black cockatoos were conspicuous both because of their large size and their noisy calls. It was late enough in the day that they were returning to their roosts from feeding, so we saw a fair number. Wonderfully impressive birds. Finally, we pulled into camp at Keep River National Park. I set up my tent and then dashed off to take photos before the light was gone. 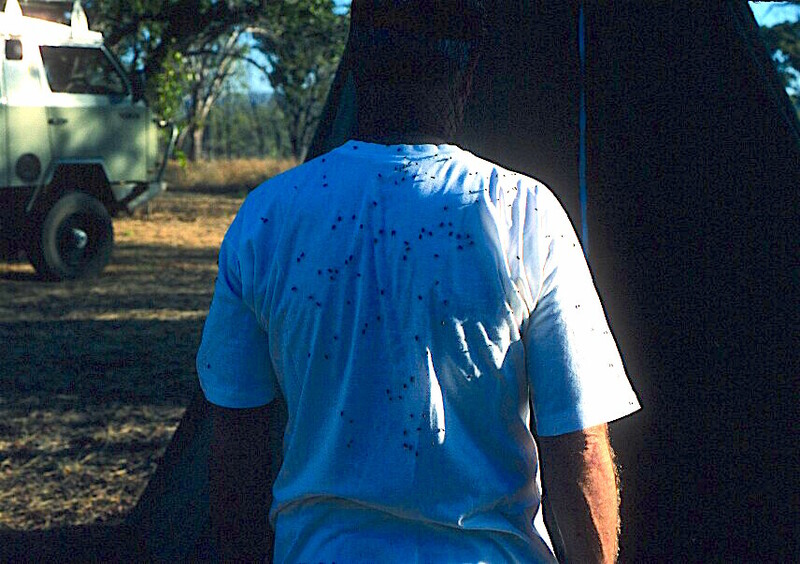 I’m happy to report that the flies are not nearly as bad here. 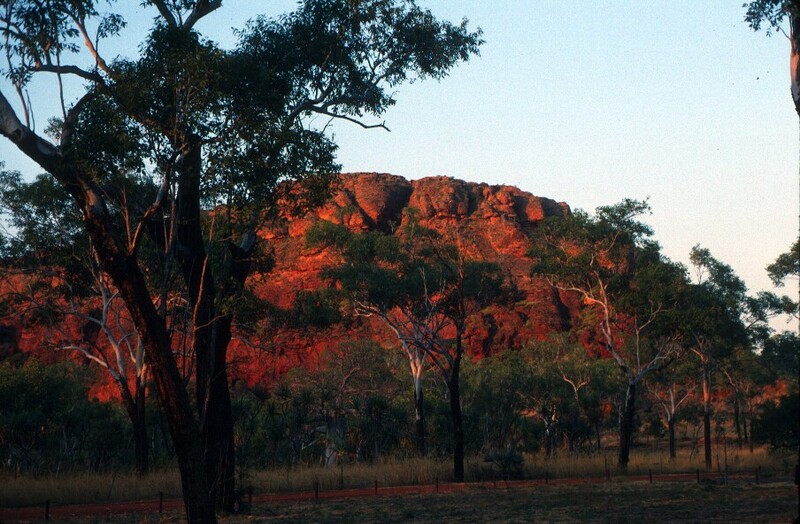 It is, in fact, a really lovely location, surrounded by screw palms, gum trees, and high, red cliffs. Excellent evening again with my charming traveling companions. Another great meal (thanks, Kate). John came around to sign us up for helicopter rides at two sites still ahead of us (areas remote enough that helicopters wouldn’t just be there without someone ordering them). The rides are a bit pricy, but I’ve spent enough money just getting here, it seemed a bit foolish to miss this opportunity in the name of frugality. These two flights are, after all, considered to be among the highlights of the trip. We’re leaving Menu Camp today. We were up early enough, and collapsed and packed our tents and sleeping bags swiftly enough, that we were all in time to photograph the sunrise. Then we had breakfast (toast and Vegemite, hurrah!–I’ve missed it), packed up the truck, and hit the road. It’s winter, the dry season up here, so the sky was clear and brilliant. 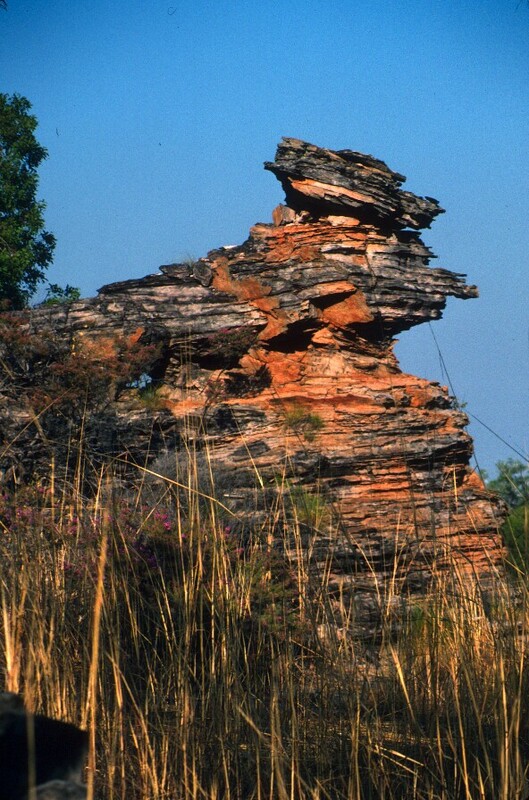 The scenery changed frequently, with varied plants, and animals punctuating the remarkable landscapes. 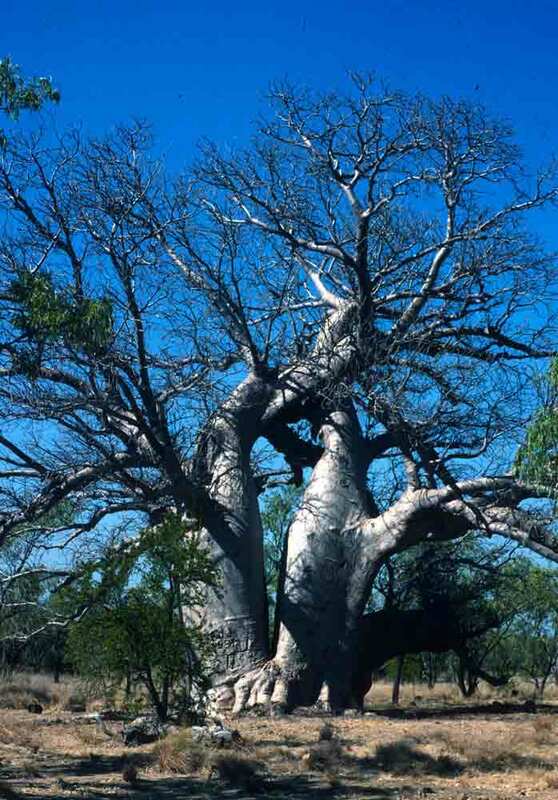 Began to see boabs, those weird, bloated tree that you only see in this corner of Australia. We traded eucalypt savannah for weird, lunar desolation and dead trees, then back to savannah. Smoke on the horizon again. Guessing it’s the annual burn-off that Aborigines have so long done in this region, and which more recent arrivals have learned to do, to prevent uncontrolled wild fires. A massive, ancient, red-rock escarpment rose to our right, the jumbled slopes and flat top covered with trees, but the perpendicular red walls, bare. So many grasses: short and golden, tall and red, like sheets of velvet in some places, rigid tufts in others, green, yellow, tan, from a few inches up to seven feet tall. Rapid-fire wonders: bustards, huge black cockatoos, clouds of corellas (small, white cockatoo species), “ant” hills (really termite mounds), kapok flowers, feral donkeys (one with a small, black foal), butcher birds, and bursts of small, dark swallows with white breasts. 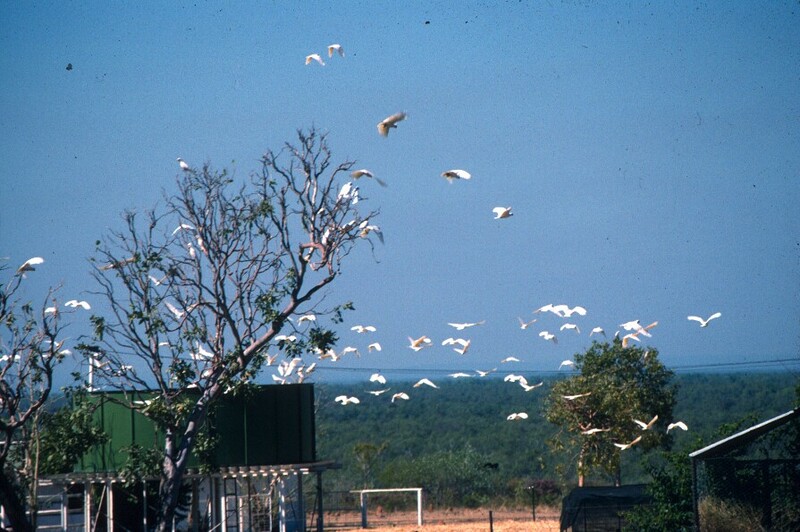 At a large waterhole, we saw cormorants and egrets, and the trees were filled with galahs. 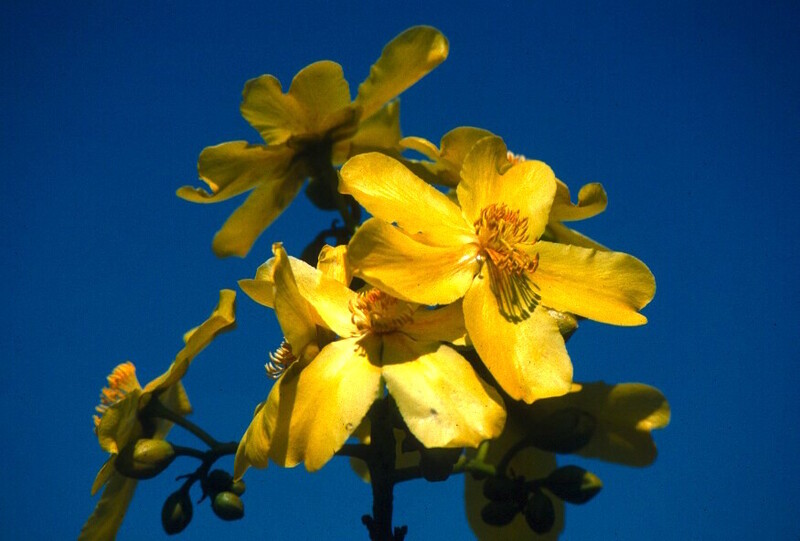 Melaleuka scented the air, though they were outnumbered by gum trees. Still, the constant background for these changing vistas was heat, dust, and rocks. Into Bradshaw Station complex. Not a planned stop, but the trailer hitch needed to be fixed. We took advantage of the stop to photograph flocks of cockatoos, the imposing escarpment, purple-flowered wild tomatoes, yellow-flowered kapok, and pink-flowered turkey bushes. Hitch fixed, we were on our way—though only to the edge of the Angalarri River, which feeds into the Victoria River, the largest river in the Northern Territory. 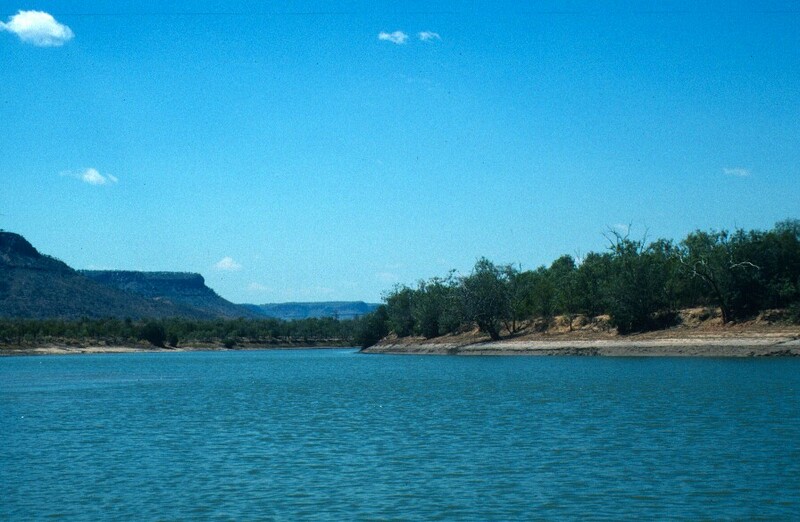 Joe Bradshaw, for whom the station was named, was the first white man to settle the far side of the Victoria River. 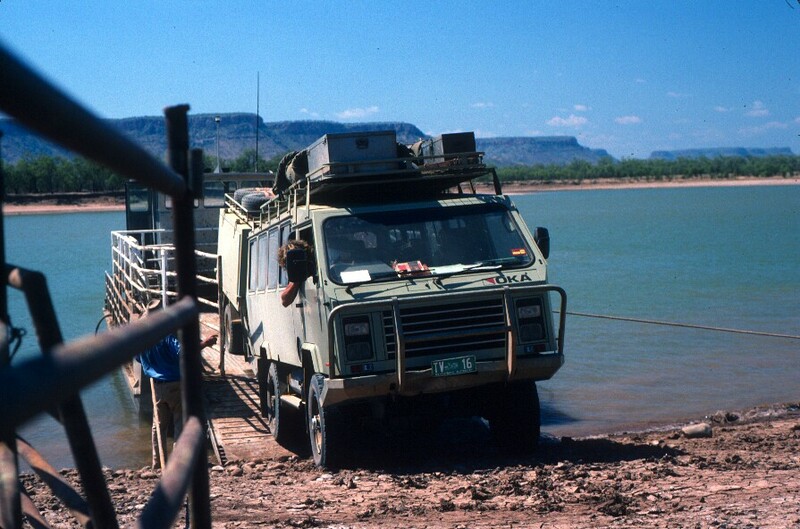 The only way across the Angalarri is by boat, but there is a barge here that is used for moving equipment, supplies, vehicles, and livestock, and it is plenty big enough for our 4WD and a bunch of campers. We crossed the river at an angle, which gave us the opportunity to see a considerable amount of wildlife or signs of wildlife. This is a tidal river, so there are saltwater crocodiles here, and we saw a fair number of crocodile “slides” down muddy slopes into the water. Kangaroos and wallabies watched us from the banks. I was delighted to see mudskippers hopping along the shore. Wattles, with their fragrant, yellow flowers, grew in large clumps. Birdlife included black cormorants, whistling kites, and a white-faced heron. We also saw a number of gorgeous white-breasted sea eagles, which prompted the gentleman driving the boat to relate the mating rituals of these impressive birds. To get the attention of the female (which is the larger bird), the male catches a fish, takes it high in the air, then drops it, going into a power dive and catching the fish again just before it hits the water. If the female is impressed, the two fly high into the air, lock talons, and spiral toward earth, letting go just before they crash. They mate for life. It was not an easy transit, but it was rewarding. After two hours, we reached a lovely series of short waterfalls that tumbled from pool to clear pool. 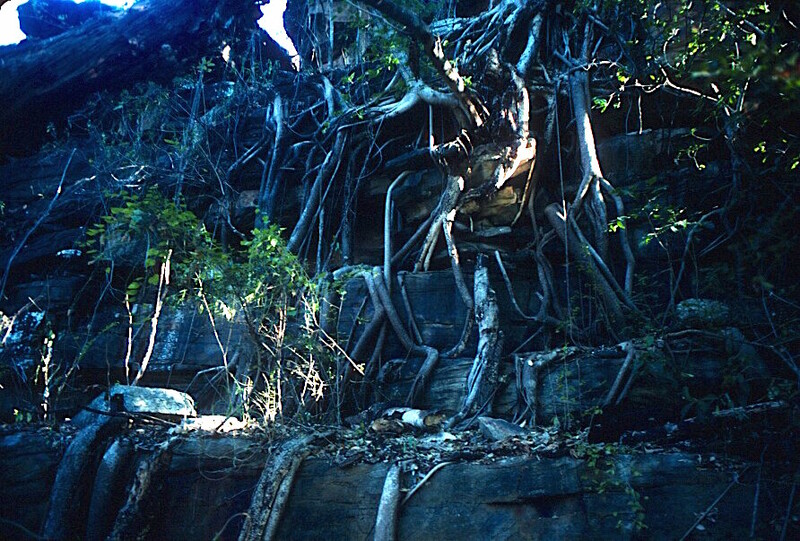 Calcium deposits had formed around the falls and tiny plants grew among the formations. We dropped our daypacks and pulled out our swimsuits. The dense vegetation made it easy to change and remain modest. We spent a fair bit of time—half an hour I’d guess—splashing in the largest pool and drinking from the nearest waterfall. It was absolutely wonderful. We had lunch there as well, sitting on the rocks, chatting and drying out. It was a day of amazing beauty, but also of a considerable amount of difficulty. Of course, fatigue wasn’t helping me, but even weary, I didn’t want to leave my camera equipment behind—which may not have been my wisest decision. As we headed back up the gorge, I wasn’t entirely convinced I’d survive the return trip. I did, of course, survive, though I’m now pretty well covered with scrapes and bruises, from having stumbled a few times. But with one last surge, I made it up the stone wall to the broken rocks that marked the top edge of the gorge. After hiking back to camp, I enjoyed a cool shower in the creek-water shower. (Yes, we swam in the gorge, but the temperature is around 100 degrees and it was a long hike back, so the cooling effects of that dip had long since worn off.) Pleasant late afternoon in camp. The sunset was beautiful, but is appreciated for more than its splendor—it means the flies go to bed. I haven’t gotten much sleep lately, but with a good meal and after a day of fresh air and considerable exercise, I don’t think I’ll have any trouble sleeping tonight. calls presage the advent of dawn. The air is cool and sweet and smells of grass. By 6:30, the sun has still not made an appearance, but the stars have faded and, as was the case yesterday at this time, the crescent moon was still visible, in a silvery lavender sky that got paler the closer it was to the fiery horizon. 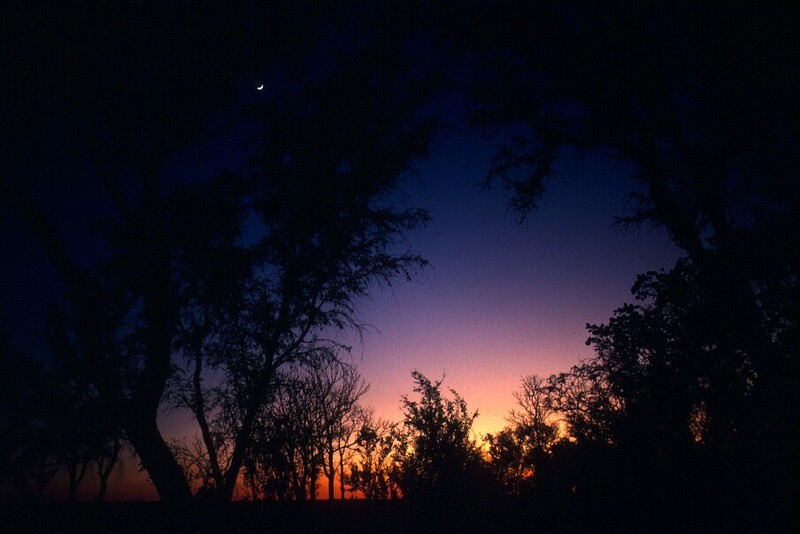 Time to get up—not just to face the day, but also to photograph the spectacular predawn sky. After a good breakfast, we were off and hiking up to and then down into Menu Gorge. We headed away from camp through the tall, golden grass, across flat, broken, black and red rock, to a place where we could descend a steep tumble of huge boulders to the base of the gorge. 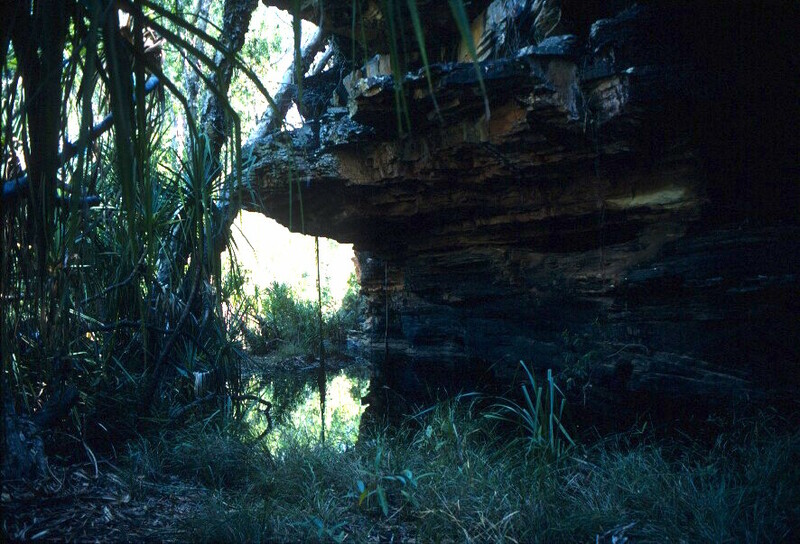 Pandanus, paperbark trees, and thick vines crowded in on either side of a narrow stream that runs down the center of the gorge. We hiked through more tall grass and deep leaves, over “streams” of rocks (no doubt stream beds when there is more water during the rainy season), and scrambled up and down massive piles of boulders and ragged rock walls. The stream became wider as we headed up the gorge. The water was so clear that we could see the bottom, as well as the fish that were swimming among the submerged rocks and branches. I loved the look of the pandanus, despite the serrated edges that clawed us as we passed. At one point, made our way through a beautiful grove of screw palms. Because the day was already heating up, we stopped by a pool, where the stream widened a bit, to take a drink and splash ourselves with water. The earth became redder as we continued on, and the trees became greener. The road was rough, the weather hot, the flies, dreadful, the scenery, brilliant. In the distance, we could see smoke rising from a brush fire. It must have been a big one, as the smoke rose to the clouds from an area miles long. We eventually rolled onto the historic Bradshaw Station, an area of roughly 3,475 square miles. The remoter areas of the station are now used by the military, and we had seen evidence of that back in Pine Creek, where a fair number of jeeps and gents in camo had also stopped. 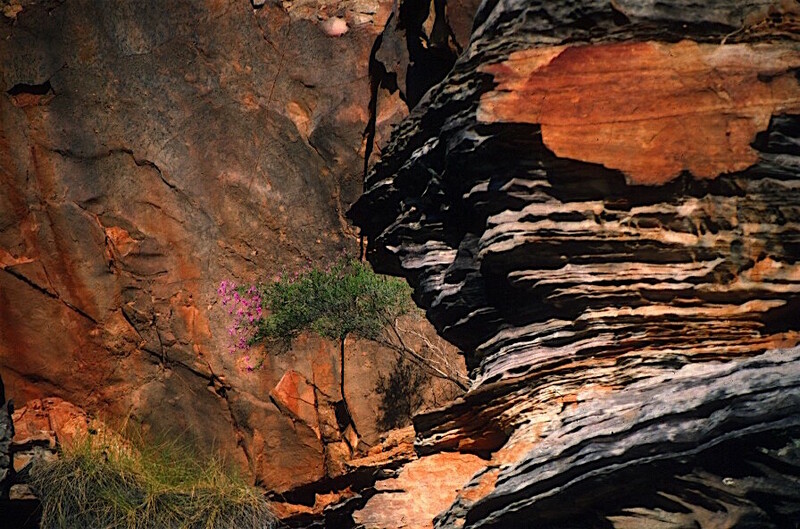 This part of the station is known for the antiquity of its Aboriginal rock art, which apparently appears throughout this region, and the afternoon held a stop at a rock “gallery” where huge stone outcrops offered both shade and “canvas” for ancient paintings rendered in white and red. Clouds of butterflies heralded our arrival and pandanus lined our route as we hiked amid the rock walls. It was surprisingly cool in the shadow of the rock. 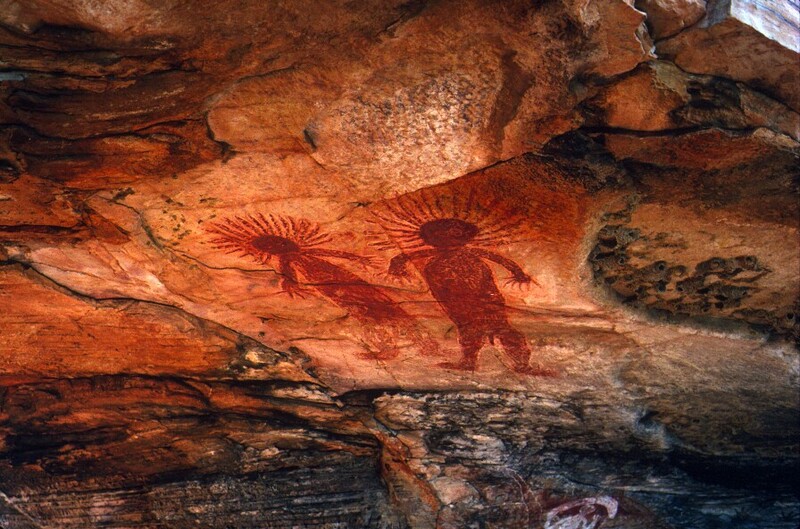 The paintings were, on the whole, less complex than many I’d seen in Kakadu National Park, on my first trip. However, they were still fascinating, and one could easily recognize many of the creatures depicted, along with the handprints that connect painters with the rock and their work. Then back on the road, across the harsh and ancient land. My heart sang, resonating again to that special something that this land possesses that so touches me. Pulled into Menu Camp around 5pm. This area was a spot where drovers used to stop to eat, which is how it got the name Menu. There was a nice campsite set up already. It is, in fact, permanently here, just for the camping outfitter with whom I’m traveling. It offers a screened dining area, a creek-water shower, and a dunny (outhouse/toilet) that faces the sunset. This is a spot of great beauty—but also of many flies. After putting up our tents and getting our gear stowed in the tents, Athena, Belinda, and I set off to explore a little before dinner. 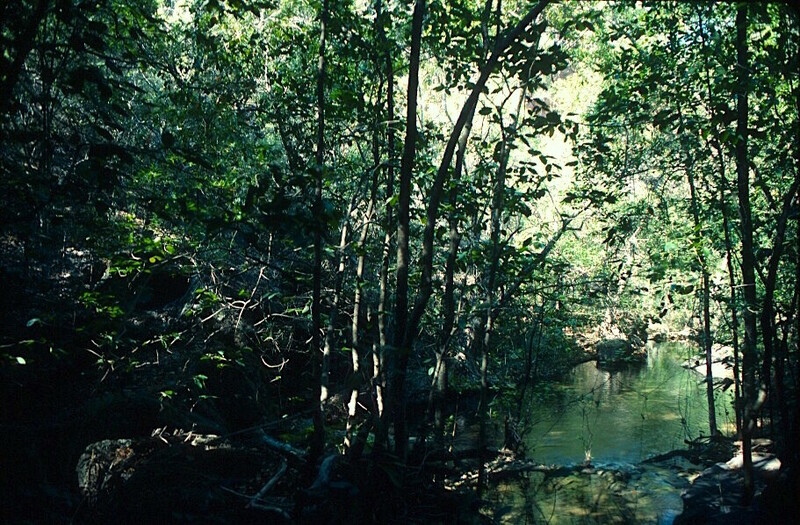 We wandered amid trees and then down to the creek, which is narrow but clear and lushly surrounded by pandanus. Dinner was great fun. This is an excellent group of bright, charming people, and Kate is an excellent camp cook. After dinner, we sat around the campfire, sipping coffee and admiring the dazzling splash of stars overhead. I was delighted beyond measure to see the Southern Cross again. Then we headed for tents and sleeping bags, as we have another early start tomorrow. Alas, the coffee proved to have been a mistake, as despite what by now was full-fledged exhaustion, sleep evaded me for far too long. Sigh. It is 6:30 am, and I am packed and at the door, awaiting my departure. It is a remarkably beautiful morning. The moon, a huge crescent, has not yet set, and the sun has not yet appeared, though the sky is silver and orange at the horizon from its approach. The cascade of bougainvillea just outside the door, the palm trees outlined against the brightening sky, and the chirping and singing of dozens of birds make the difficulty of getting here kind of dissolve into unreality. I am overjoyed to be back. By 7:00, I was safely planted in a khaki-colored 4WD and on my way. We rolled around town, picking up other travelers. We stopped outside the Hotel Darwin, which I’d hoped to visit when I thought I’d be arriving much earlier yesterday. Sigh. Through the front doors, I could see the ceiling fans of the Green Room, which seemed unchanged from when Judy and I had enjoyed drinks there during my first trip. Then we were on our way, heading south on the Stuart Highway. 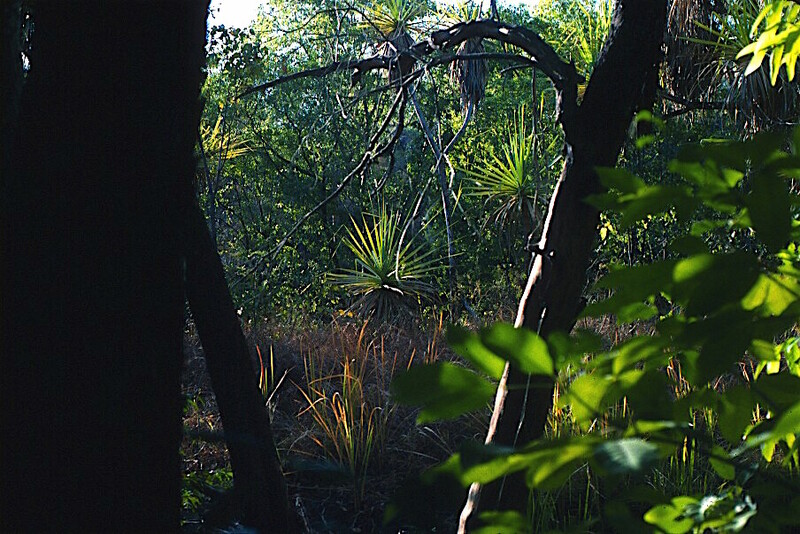 The weird beauty of the surrounding savannah delighted me: the slender gum tress, the palms and pandanus, and the stretches of dry grass and brown-red earth. The air is wonderful, clean, and scented by eucalypts. Termite mounts, from little ones all the way up to the giants, are now frequently visible from the road. 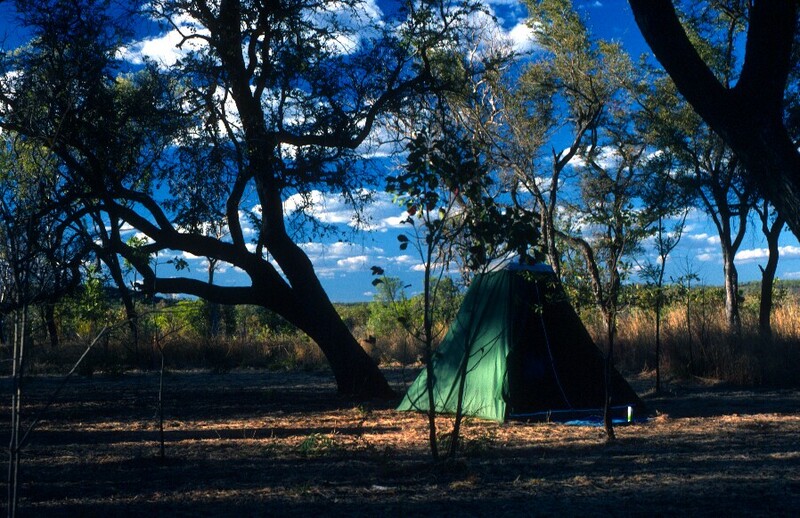 Paperbark trees and yellow-flowered kapok bushes also appear on occasion, but mostly we just see miles of various gum trees and dry grasses spreading across the plains and blanketing the frequent hills and ridges. We drove through Adelaide River, a tiny town that became remarkably important during WWII. It was a huge center for troops and airfields, especially after the Japanese bombed Darwin, and it became an important supply and communications base for the Australian armed forces. Along the road, we saw signs identifying where each of the many WWII airfields was once located, as well as a sign for the Adelaide River War Cemetery. I think much of the world forgets (or never knew) the impact the war had on Australia. We had a morning break in Pine Creek, an old gold mining town that is a popular place for travelers to stop—largely because there aren’t that many places out here where you can stop. 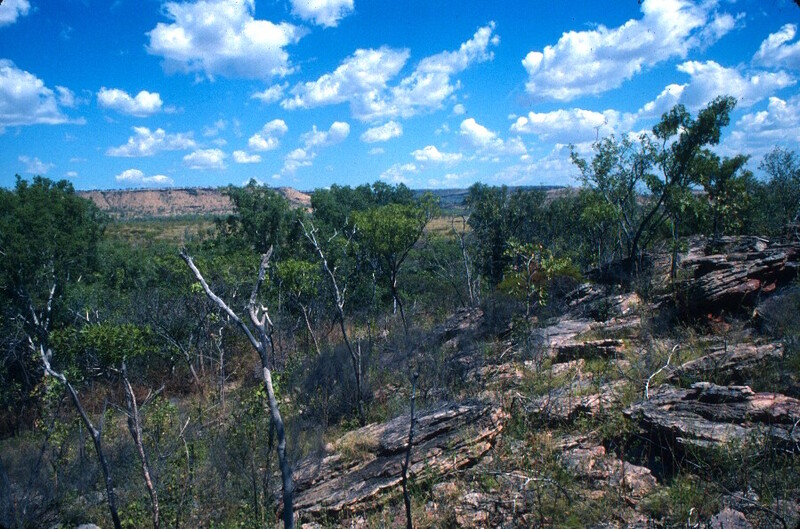 While the population is less than 700, it still manages to rank as fourth largest town between Darwin and Alice Springs. 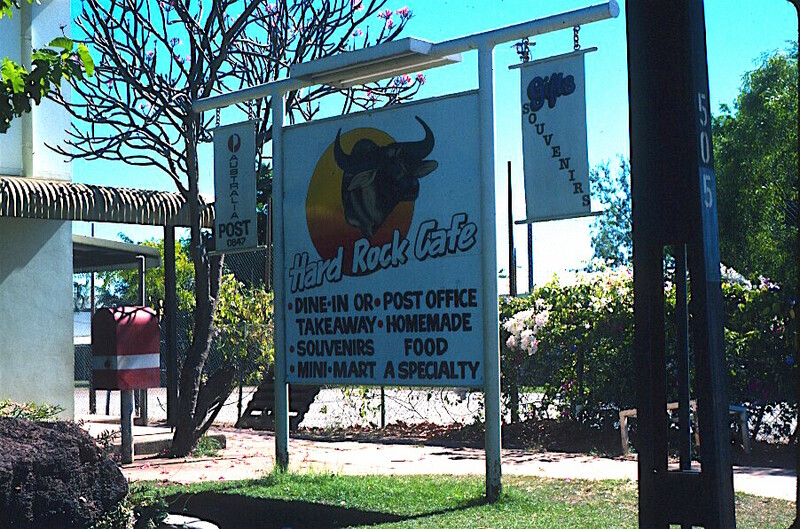 I was amused by the roadhouse, which identified itself as a “Hard Rock Café.” While food and drink were on offer, as is the case with so many of these remote outposts, it also serves as post office and market for both locals and travelers. Deep pink bougainvillea, wildly perfumed pale pink frangipani, and noisy birds made the small settlement charming. Turning westward, we left the sealed (paved) road behind, so transit became a bit bumpier—but for me, that always feels like adventure. It was a spectacular, brilliantly clear day, with the sky a fabulous, unblemished blue. We continued to be surrounded by that strange, undulating sea of eucalypt-dotted dry grass savannah that could not by any means be described as beautiful, but which delighted me none-the-less, since it carries so many memories for me. Large birds—I’m guessing kites—gracefully dipped and rose on rising thermals, sailing over the dry land in search of food or perhaps looking for a mate. Lunch was at a beautiful location on the banks of the Daly River. As always in arid regions, one can recognize a watercourse from a distance because of the sudden intensifying of vegetation. 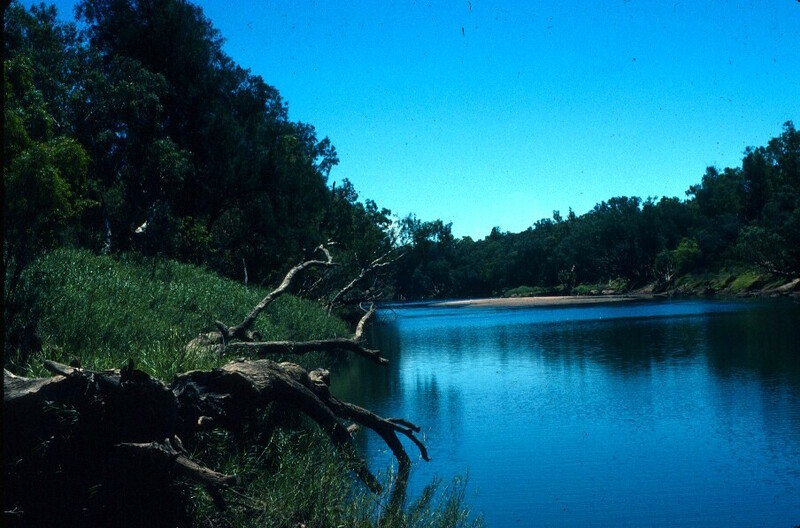 Here, bright water wound between flourishes of green and stands of gum trees taller than those that dot the dry plains. It looked inviting, as the weather was hot, but we were warned to stay clear of the water, as it is inhabited by saltwater crocodiles. This is definitely a region where it’s good to have a guide.